A short throw ratio of approximately 0.8-1.0:1 adds flexibility for installation in narrow spaces. The powered zoom/focus/lens shift features allow convenient setup by remote control. 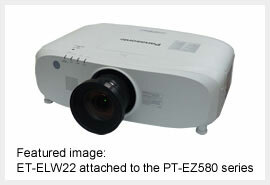 The ET-ELW22 is compatible with the PT-EZ770 Series and PT-EZ580 Series of Panasonic LCD projectors. The lens can be easily shared between the two lines due to a quick-detachable design.